Out March 25th, Bob Dylan in the 80s: Volume One is a compilation of covers by the likes of Built to Spill, Craig Finn of the Hold Steady, Deer Tick and many others of songs from Dylan's most maligned decade. But as with most maligned things by great artists, Dylan's Eighties work is ripe for re-evaluation, and the album's liner notes include a provocative, insightful essay from novelist Jonathan Lethem, which we're pleased to present to you below. Bob Dylan in the '80s? To paraphrase Crawdaddy's Paul Williams, who frequently played the role of Dylan's sole critical defender during that time, What Happened? Here's what: In the '80s our hero enunciated, for anyone who cared to listen, that big as he was, he wasn't bigger than rock 'n' roll itself. Bob Dylan's performances, his songwriting, even the way he dressed, seemed designed for a while to say that he was a part and a function of something else, something he recognized extended well beyond his own immense boundaries. In the '80s Dylan humbled himself to an immersion in the practice of his art as a genre, letting go of the "genius" tag as fully as rock 'n' roll's "paradigmatic seer" (Ellen Willis's term) ever could. In the '80s he went on David Letterman dressed up (at least in his mind) as Gene Vincent, backed by the LA Chicano-punk band The Plugz; in the '80s he melted himself into The Grateful Dead for a spell; in the '80s he reached several times for the nearest-to-hand hot radio-friendly producer; in the '80s he sang on "We Are The World" and during the recording session had to be schooled in how to sound Dylanesque by none other than Stevie Wonder (go find the evidence on YouTube before you choose to disbelieve me); in the '80s he got it on with the back-up singers; in the '80s he became a Wilbury, declaring himself an equal partner with Tom Petty and Jeff Lynne and the neglected, second-class-citizen Beatle, as well as enunciating his '50s sourcing with the inclusion of Roy Orbison – the superest of supergroups functioning also as an egalitarian leveling device; in the '80s he floated bemusedly through a Hollywood film as glitzy and incongruous as any Elvis Presley vehicle (and worse than many). Most of these choices were likely to disenchant a thousand fans for every one they enchanted – specifically, of course, these gestures were destined to disenchant those who'd begun listening to Dylan in the '60s and hung on through at least the first half of the '70s. In retrospect, they were gestures of freedom as well as confusion, gestures of self-possession and self-reinvention, explorations of what exactly it meant to be an Icarus who'd survived and now had to become part of a small tribe inventing what it was to be an aging rock 'n' roller. For some of us, though, the earlier Dylan belonged to our parents, while '80s Dylan was our Dylan. Let me be specific: the first new Bob Dylan album I recall coming out was Slow Train Coming, the first new Dylan single I ever heard on the radio was "Gotta Serve Somebody" – both 1979. And I'm old, or at least likely older than most of the musicians playing on this record. Of course, we had our parents' albums to delve through, and while we were growing up we'd hardly have been able to avoid earlier Dylans, say the 1965 and 1974 versions, which remained ascendant in popular culture – in fact, they were precisely the stick being used to beat up present-day Dylan. So, we conducted these retrospective explorations; meanwhile the man seemed to be trying to speak to us in real time, often urgently, and frequently, too: Bob Dylan wasn't exactly in hiding in the '80s, even if some believed he ought to be. Squaring those two opportunities – to explore his riches in retrospect while contending with his scrappy, lurching-along progress – was a rich occupation for fans my age, if sometimes also a baffling one, at times seeming to resemble being "in love with the ugliest girl in the world" (Dylan's phrase). There's an aura of rejection and embarrassment still hovering over that decade in Dylanology. It clings to such an extent that it's become "officially" inscribed in the tongue-in-cheek but godawful PA announcement that has preceded many hundreds of Dylan's live shows in the 21st century. The shortest, and possibly the most widely-heard biography of Dylan's career goes like this: "Please welcome the poet laureate of rock 'n' roll. The voice of the promise of the '60's counterculture. The guy who forced folk into bed with rock. Who donned makeup in the '70's and disappeared into a haze of substance abuse. Who emerged to find Jesus. Who was written off as a has-been by the end of the '80's and who suddenly shifted gears releasing some of the strongest music of his career beginning in the late '90s…". Tongue-in-cheek or not, Dylan himself rarely looks to the '80s catalogue for songs for live performance, seeming to have accepted the foolish popular verdict. Yet, given the benefit of decades more hindsight, our Dylan was a lot better than anyone knew. This fact seems to me unmistakable (and, thanks to The Bootleg Series, which restores so many essential '80s tunes to the canon, others can agree with me without violating Dylan's copyrights). 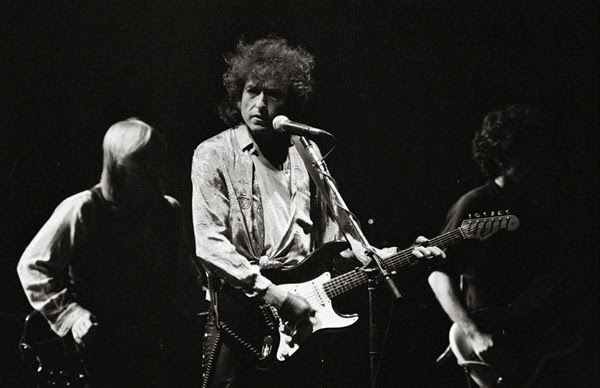 Were one to begin compiling instances of greatness in the type of songwriting that defines our esteem for the earlier Dylan – complex, suggestive, glinting, cascading constructions – you'd hit a dozen examples even before the "comeback" of Oh Mercy: "Groom's Still Waiting At The Altar", "Clean Cut Kid", "Foot of Pride", "Angelina", "Jokerman", "When The Night Comes Falling From The Sky", "Caribbean Wind", "Blind Willie McTell", and on from there. That's not to mention the boiling rockers – "Property of Jesus", "Julius and Ethel", "Shot of Love", nor the sultry, steely tone-poems and memory-songs – "I and I", "In The Summertime", "Pressing On", and "What Good Am I? ", nor the giddy pop, like "Tight Connection To My Heart" and "Heart of Mine". And so on, and so on – the point being, I've still only named a few of the terrific compositions covered here on, as they say, "the album you hold in your hands" (or "in the cloud to which you have presently ascended"). There's a second thing to say about Dylan's '80s work: besides being good, it's highly continuous with the stuff that precedes and follows it – despite being, as I've said, sort of containerized in disrepute. "Most of the Time" isn't just a perfect emotional x-ray of a lyric, it's a rewrite of the sour-grapes "Don't Think Twice, It's Alright" (and both derive, of course, from precedents like Hoagy Carmichael's "I Get Along Without You Very Well"). Try fitting the lyric of "Congratulations" to the tune of Desire's "One More Cup Of Coffee" and you'll better understand where the Wilburys song's peculiar ache comes from. Gene Ween & Slash, on the present compilation, remind us that the Dylan of "Wiggle Wiggle" isn't completely distant from the novelty-record Dylan of "Rainy Day Women." Dylan's '80s songwriting and performance modes – the reliance on blues and folk collage, the revival of his Edward Lear humor, the weird displacement of an authoritative "voice" into fragmented asides – now look like a toolkit for his universally-acclaimed post-Time Out of Mind four-album victory lap. If you're skeptical, consider just how naturally a "Got My Mind Made Up", "Cat's In The Well", or "Seein' the Real You at Last" would fit onto Together Through Life or Tempest. Dylan's decade of being a "bad companion" for his fans seems, paradoxically, to be the period in which he discovered the terms by which he'd become the permanently good companion he seems to us now. Yet the decade remains terra incognita even for many of the reinvigorated Dylan-heads captivated by the 21st Century albums. The '80s records remain outré, in some way even Dylan-the-Nobel-Candidate can't quite redeem. For this, maybe we '80s buffs should be grateful. How generous of Dylan, bestower of so many incomparable and outlandish treasures, to give us some guilty pleasures and secret treasures as well. This compilation's tunes, therefore, may serve as many a listener's introduction to the material in question, rather than as "covers" of familiar classics. That's no problem: in either listening register, there's copious delight to be had here. Was it really necessary that I played this compilation hundreds of times before writing this note? Truthfully, no, I probably could have written this after hearing it once. Yet, as it happens, I've had the thing on repeat in my office intermittently for months now. It's become one of those soundtracks that life sometimes coughs up to color a segment of its duration, as well as a good companion of its own, one I begin to reach for seeking the consolations of the familiar. I won't preempt your own explorations and evaluations, except to say that in the famously difficult art of going up against Dylan's performance of his own material, a number of these reach the highest threshold. I don't know who Hannah Cohen is, but "Covenant Woman", for instance, goes straight onto my very highest shelf, as does Craig Finn's "Sweetheart Like You" (and listen carefully for a brilliant tiny rewrite concerning the song's "cute hat"). As a parting remark, I'd like to say that I hope Bob Dylan (Bob? Are you out there, Bob?) listens to this record, and that he plays it for his current touring band. He could do worse, much worse, than adopt it as a set-list, one of these Never-Ending nights.